Carving up yoga into levels of physical difficulty, though, does not give the right impression of it. It sends the message that yoga is about how well conditioned and flexible your body is. … which is miles away from what yoga really is all about. In fact, I rarely meet anyone who is not a yoga beginner … and that goes for most yoga teachers and high-flying yoga personalities on the yoga scene today too. So what makes someone advanced in yoga then? Is it how flexible their body is? How graceful they move through a series of yoga poses and how perfectly aligned and stable they can hold those difficult positions? The modern yoga class culture would seem to suggest so. But if that were true, then hundreds of elite athletes, dancers and circus performers would be virtual yoga masters in their own right. But they aren’t, because yoga has very little to do with how flexible and toned your body is. Actually, in the grand yogic scheme of things, these physical abilities really don’t count for too much. I’ve met many people who can do incredible things with their body … yet they can’t even seem to control the simplest of cravings or refrain from indulging in every little desire that springs up … and their personally lives seem to be in no less disarray than the average person. I’ve even seen contestants in a so-called “yoga competition” get into an argument and nearly come to blows! Being advanced in yoga means much more than just how far you can bend backwards. It means possessing an “uncommon” level of dignity, poise and self control. ... and above all else, it means living in a way that reflects a deeper understanding of our place here within this Universe. We rarely see this kind of example in yoga today. Yet we keep seeing the term “advanced yoga practitioner” being attached to more and more bendy stretchy folks. If flexibility and body control are the main means by which we are measuring someone’s “level of yoga,” then I’m afraid we’ve really gone off course with our notion of what yoga means. Aside from some basic physical practices, yoga for beginners starts with some fundamental guidance in the yogic approach to overcoming the problems that ail us – our mental and emotional issues and well as our physical ones. If, right from the start, yoga teachers start to approach yoga for beginners with this more comprehensive view, then instead of seeing people evolve into more and more flexible “yoga beginners”, we might start to see some actual “advanced yoga practitioners” emerging onto the modern yoga scene … just maybe. 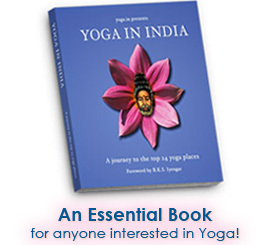 Yogacharya is Director of International Yogalayam, Editor of The Yoga News, and creator of “The Yoga Tutor”, a step-by-step, online yoga training program.